The Chuparosa (Spanish for Hummingbird) is designed to be a very versatile hardtail mountain bike. 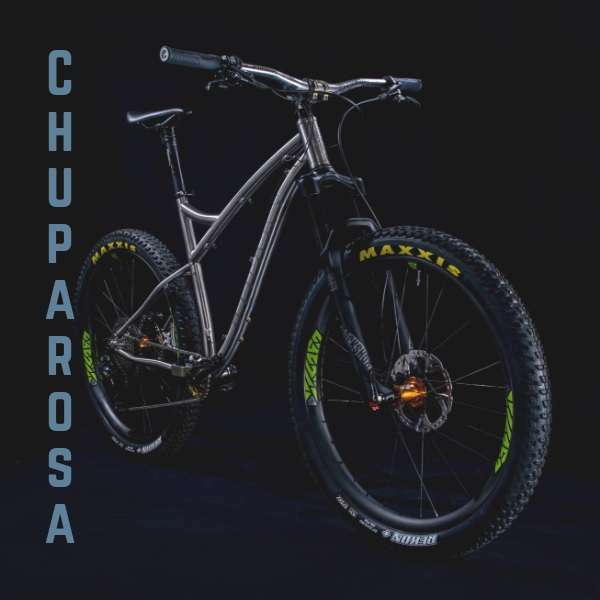 With a quick but stable geometry, the Chuparosa is at home climbing twisty singletrack or descending fast rocky trail. It’s happy on 29″ tires as a fast trail bike that would give a good account of itself in a cross-country race, but it’s sweet spot is on 27.5+ tires with longer travel, running through rocks, roots, and technical singletrack. * Purchase is for frame only. Note: These additional options are available on HAND-BRUSHED FRAMES ONLY. Support the Arizona National Scenic Trail through your purchase of the unique Binary Bicycles AZ Trail headtube badge. 100% of your $25 will be donated to the Arizona Trail Association. The Chuparosa can use 27.5 x 3.0 up to 29 x 2.6 wheels and tires. It’s designed to run 120mm up to 140mm forks and the rear dropout spacing is 148mm boost. The sliding dropouts mean you can run any Paragon compatible sliding dropouts. This makes it easy to adapt to singlespeed or to your axle and hub requirements. Find out more about the Chuparosa 27+/29er. NEED MORE OPTIONS? Does your unique riding style or environment require something a little different than our standard frame features? Contact us to discuss how we can help provide the characteristics you need!